2010 A New Year and A New PlanEliminate The Muda! A few years ago I had an awakening; some might call it a mid-life crisis. It wasn’t simply because I had turned 40, in fact it was before that. It was simply an awareness that while my life was fulfilling, I was also wasting a great deal of it. Even though we were living the American dream, I had a growing sense of anxiety. There was something missing. While researching some business management techniques and analyzing the organizational efficiency of a customer’s business, I began reflecting on my personal efficiency and accomplishments. When I considered that I was watching 20-30 hours of TV each week and spending another several hours reading fiction, I was suddenly struck by the opportunities I had missed. There were also inefficiencies due to my disorganization, poor time management and the list goes on. At that point I vowed to give up many of my idle activities. I became determined to only read books and periodicals that would enrich my knowledge or teach me something new. I became committed to avoiding television that was frivolous. Time management and organization, for the first time, was important enough to take action. As a result, I have committed myself to taking on at least one new major project each year, something that would expand my knowledge, maybe learn a new skill, or find some way to improve myself. I will also complete several smaller ones in an effort to be as productive as possible each year. So what is the big project for 2010? This has been a tough one to decide. There are so many things that I want to do in life. Learning how to fly would be wonderful, but that is really expensive and the desire to fly does not outweigh my desire to build wealth. A second language was also a serious consideration. But I have nobody to practice with and am still torn between Chinese and Spanish. Weight has been a lifetime challenge. At times I drop a few pounds but inevitably it comes back. It’s no wonder; I’ve never really focused on this. Fully fund our 401K and IRAs. Contribute at least another $3,000 to our taxable investment account. Pay the equivalent of at least 6 extra payments toward the mortgage. Build another guitar – this one will be for me! Learn TurboCAD and actually create something with the CNC machine I built this year. Gain the opportunity to guest post on 12 other blogs. Make page 1 on the WiseBread list of popular blogs for EliminateTheMuda. Double my hobby income. This comes primarily from creating artistic pieces made of wood. Improve my writing and editing skills. I’ve got to become more concise. Redesign this blog for a more crisp and professional appearance. Each of these will take time and effort but not one is really a personal challenge. There is one idea I have been avoiding and it just happens to be on the list of common New Year’s Resolutions. We are saving money. I’d like to save more but we are very proud of what we have accomplished. In a way Eliminate The Muda is a dairy, plus I routinely photograph and keep notes about my other hobbies and projects. Organization is an ongoing struggle. The 5S’ that I have written about have been huge help and I am still progressing. For me that is huge, I’m just sad it took me 40 years to find something that actually worked. Debt is not a problem, we have none other than the mortgage and even it is on the fast track now. Weight is going to be the monster for 2010. Unfortunately I have also learned that 1 in 5 people fail to fulfill their New Year’s resolutions. So tomorrow’s post will be about how I plan to set and achieve this goal. Part of living a lean lifestyle is the elimination of muda, another part is continuous improvement. What are you going to be doing in 2010 to improve your life? Please share your goals in the comments below. 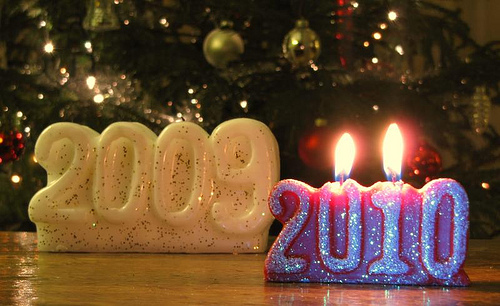 If you are a blogger and have posted your 2010 goals, please leave a link in the comments below. I’d love to put together a list that will help hold us all accountable. Great goals Lean! Wow, you can build a guitar? I love my Martin D-16 guitar, and have made it a mission to put together an “album” of my favorite songs I know how to play. I will practice all my songs forever, until I know longer have to read the sheet for tablature and words! Must be a delicate art cutting such thin and resonating pieces of wood no? Learning Chinese over Spanish is a no brainer! The language of the future! You’re almost there on page 1 already, keep it up! Regarding weight loss, what about putting up a weight monitor on your site, and updating it once every 2 weeks or month? Then, we can all join with you, as we have no idea how much you weigh and what you want to lose! .-= Financial Samurai´s last blog ..Everything Is Rational – The Answer To All Things Irrational =-. Samuari-san – So far only solid body electrics, but an acustic in in the future. As you have said, the closer to the top of the ranking the slower the progress. But if I believe, I can achieve. I’m not one to climb on a scale daily but you make a great suggestions. I will find/make a monitor and post it. I totally agree with you on personal efficiency and time management. That is the whole reason why I started my blog. I realised last year that I would have 151 days off in 2010 and decided to make myself accountable for every one of them. My theme is “Smart Efficiency” and I posted my goals on my blog. Like you, I also spend close to 30 hours a week in front of our non-digital TV, mostly watching sci-fi DVDs :). This month I want to go with 1 hour each night. As for learning a new language, I disagree with Sam (hi, Sam!). Personally I would love to learn Spanish as I plan to live there for a few months next year. I love their dance (learning salsa), passionate culture and food. With language, my theory is you should learn the one that you love and it has to come with interesting food and culture. People can say language xyz is good for your business, future etc and they are correct. But pretty soon boredom sets in and if you don’t find it personally fascinating in the first place, you will drop it altogether. These days I probably don’t watch more than 3 hours a week. I use to put myself asleep at night. On the language, I have been torn for a long time. If it was only about passion it would have to be Japanese. Either way, that decision doesn’t have to be made until at least next year. But it is definitely one of the things on my bucket list. 151 days off! That rocks! But to your point, we all have that, don’t we! I love the theme and approach of your blog and look foreward to what you will present. “Do you always run out of time? Do your weekends always feel short? Eliminate The Muda and I guarantee you’ll feel much better.